Rockfalls are a natural phenomenon wherein a single rock or group of rocks become detached from the rock face and fall. 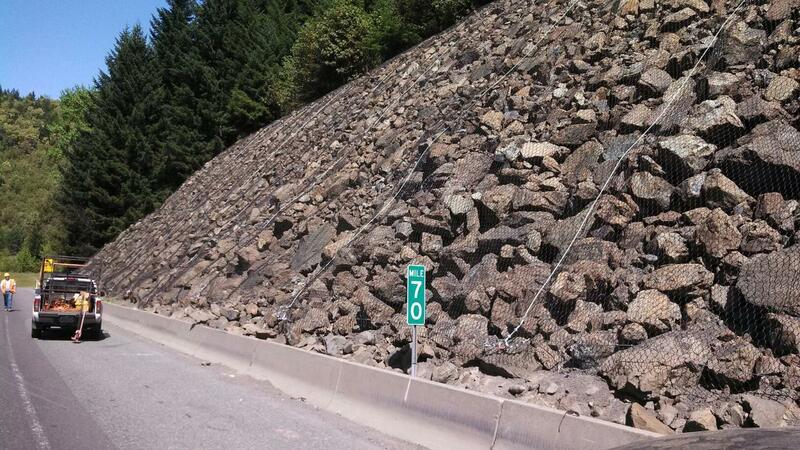 In the process, the rocks accelerate in speed, which can cause danger to drivers on highways below. While there are techniques available for slope repair and for preventing or lessening future falls, it is crucial to assess the causes of particular rockfalls to determine the best course of action. Planar, where a block of rock slides along a flat plane of rock. This may be due to faults, joints or the interface between bedrock and a top layer of weathered rock. Wedge, where a wedge-shaped block of rock is cut out of the rock mass. This failure is particularly common in limestone, shale, thin bedded siltstone, and clay stone. Toppling, where columns of rocks rotate around a fixed point and fall like dominoes. Removal of top layers of rock after mining or other disruptions can cause toppling. Rotational, where rocks slide along the curved surface. When one surface of rock is of a significantly different strength than the area beneath it, particles of different size may break off and fall. Structural causes include fractured rock or widening of fissures. Environmental causes include rain, the freeze-thaw cycle, wind, melting snow, channeled runoff, differential erosion, earthquakes, soil decomposition, springs or seeps, tree roots, burrowing animals, wild animals. Antropogenic causes where human action impacts the slope due to blasting practices and vibrations from trains and construction equipment. Depending on the section of the country where rockfalls occurs, the factors underlying them vary. In the West, rainstorms, wind, snowmelt, and channeled runoff that wash away supporting material from beneath large rocks is the largest cause. The second most common cause of rockfall is the freeze-thaw cycle where the pattern of contraction and expansion destabilize rocks. Once rocks start to fall, they behave differently, based on their own soundness, size, angularity, and the height, angle, roughness, slope, typography, and vegetation level of the slope. While geologists and specialists from rockfall companies analyze the many factors at play in rockfalls, the process is a natural one that occurs in mountainous areas. 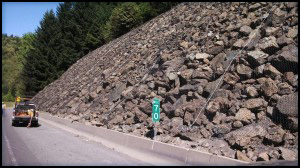 To prepare for falling rocks on highways, rockfall companies employ a variety of techniques to stabilize the hilly terrain to prevent or contain rockfalls. For information on slope repair after an incident or prevention and containment measures, contact Triptych Construction. For information about our projects or to obtain a quote, contact us at (541) 673-4903.